You can edit the settings of each page from your website to select the languages you want to offer this page in, change your page title or edit its meta description. 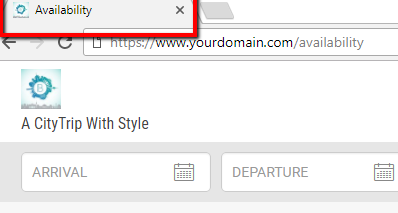 Hover the mouse over the page title and click on the Wheel icon. Here you can change activate or deactivate the languages of a page, change the Title, the Link text and the Slug as well as edit your Meta description. Language If you want to offer a certain page only in a specific language you can deactivate the other languages for that page. Title The name that you see in your Main Navigation menu, it's not public. 💡 Tip: Use same text as the Link Text because Google uses this to recognize your website pages. 💡 Note: Tailor the Titles for your different active languages. Link Text The text that appears on the website menu, visible to everyone. Meta Keywords Special keywords that help Google to select your page for relevant searches. Find out more about SEO. Meta Description The short description that Google shows underneath the title of your search result. Search bar Activate or deactivate the Search bar on the page where guests can check availability to book.